Taking care of business with DIGITAL DINING’s Table Service POS will have you operating at peak efficiency, turning tables faster and encouraging your customers to come back again and again. Security is at your fingertips with Fingerprint ID. Accommodate customer needs quickly with features like one-touch split check and split item, and keep them coming back for more with Frequent Diner rewards and smart coupons. And that’s just the start. We will custom design the Table Service POS with your operation in mind! Add the Handheld POS and you have an unbeatable combination! Have all the functionality of a desktop terminal in the palm of your hand. 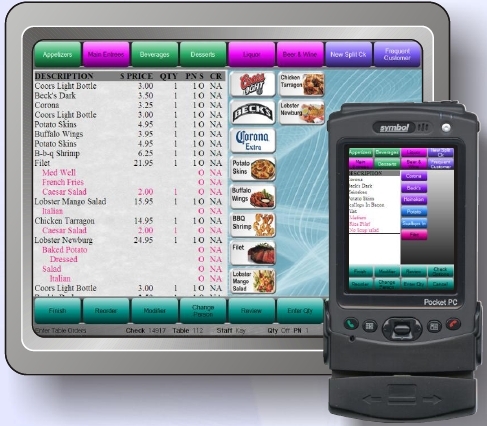 DIGITAL DINING’s Handheld POS allows servers to handle more guests efficiently, reducing labor cost and increasing speed of service and profits! Customize all POS printing for checks, prep tickets, clock in and clock out slips, and server reports. Select the features you need for particular types of POS stations based on staff departments, times of day, and days of the week. Servers and bartenders can accept credit cards for partial payments, split a check between multiple customers, and authorize a sale by simply swiping the card after placing the order. Transfer a single check, multiple checks, or all of the open checks from one staff member to another. Table staff can even transfer menu items between guest checks. All transactions are done securely with an audit trail. Hold selected menu items, such as entrees, so they do not print in the kitchen immediately. Table servers can send held items to the kitchen by setting a time of day or a day of the week on a timer for future orders. The POS replaces traditional clock ins at the time clock and has other useful features. Staff can select the department where they work as part of the clock in process. Based on the department selected, the POS assigns the correct labor rate for labor cost analysis and configures the correct features and security. Managers can also set the POS to manage break schedules in departments and edit any clock in errors.